Rocker shafts are the same for both sides but they have a top and a bottom. Notice the support screws are not all the same. 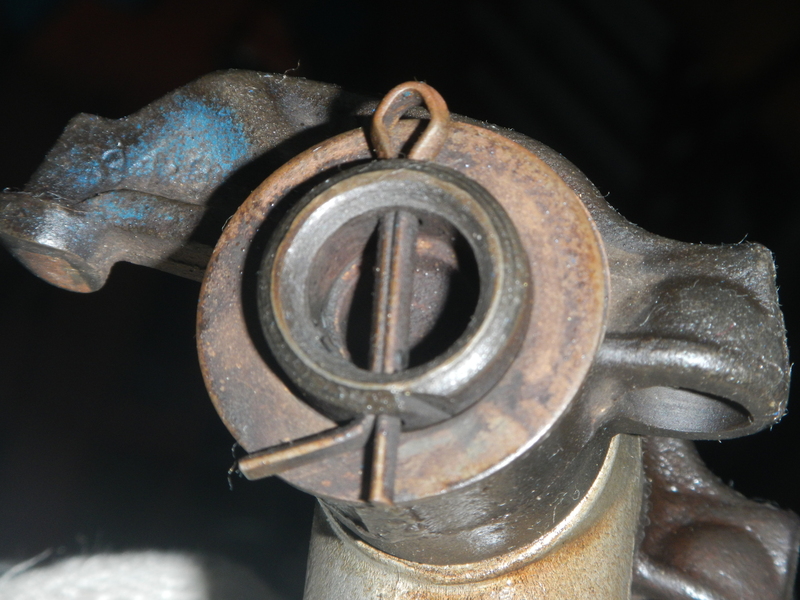 Oil must go up the head and around the second bolt from the RH side. This was covered in OIL MODS. Notice the notch on the end of this OEM shaft. It only appears on one end. When properly assembled, the notch should be at the 5:00 O'clock orientation and the rocker arm tips should face the left. That ensures the oil holes are at the bottom. 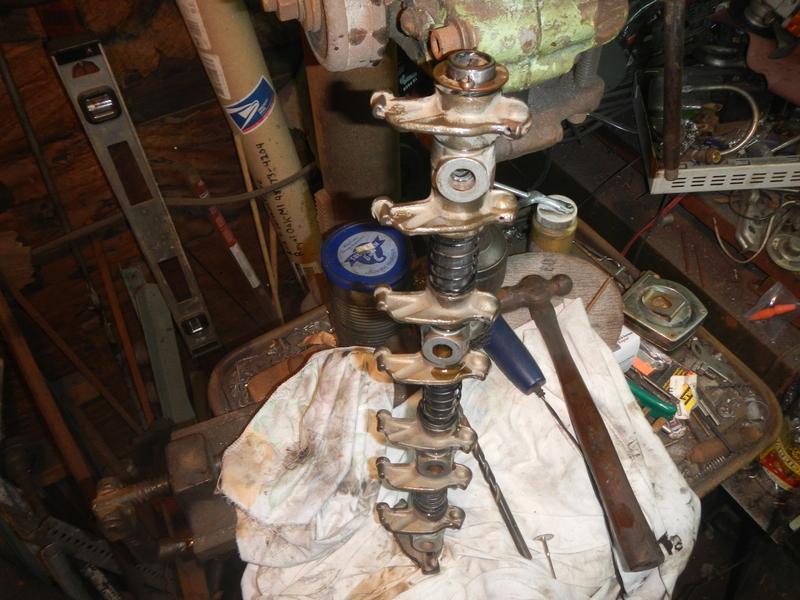 Time to strip the rocker arms and towers off the shafts. Start with the bolts and cotter pins. Notice this end has no notch. It's the other end of the same shaft. 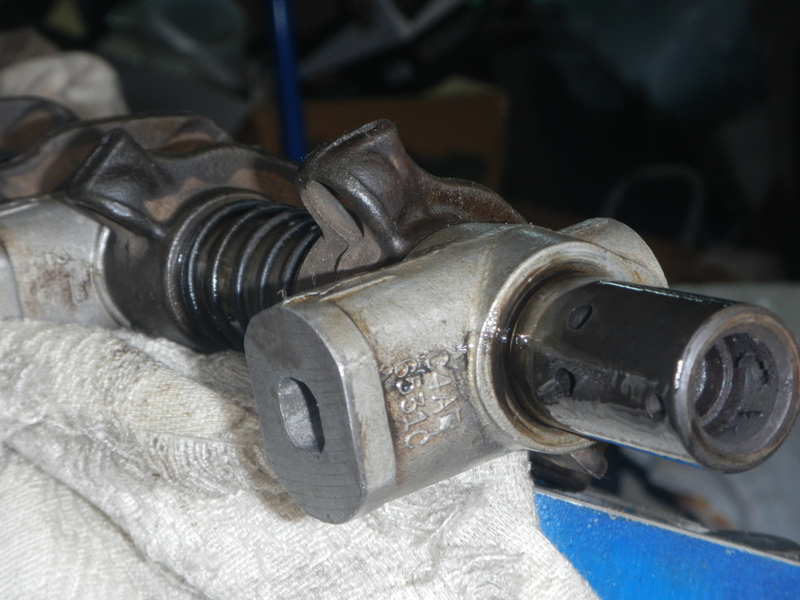 End rocker arms have spring washers to ensure alignment to the valve. 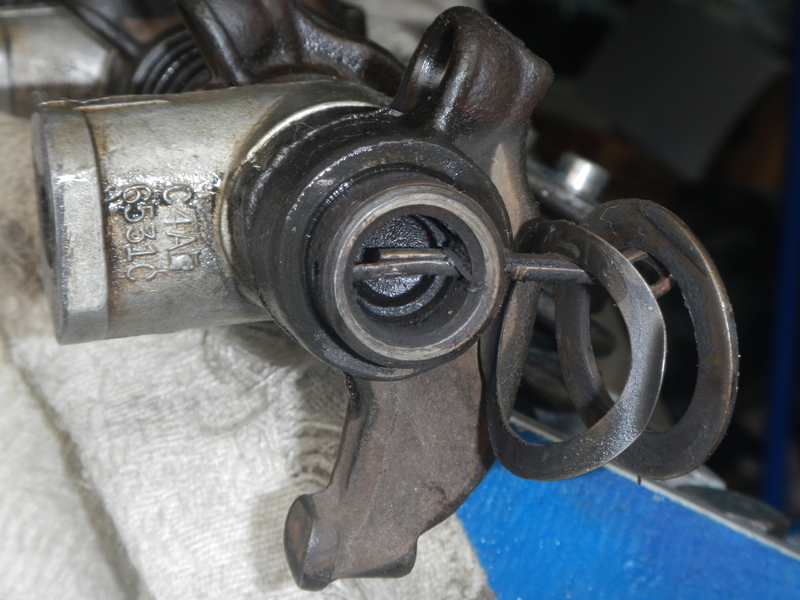 Center rocker arms have springs between them. 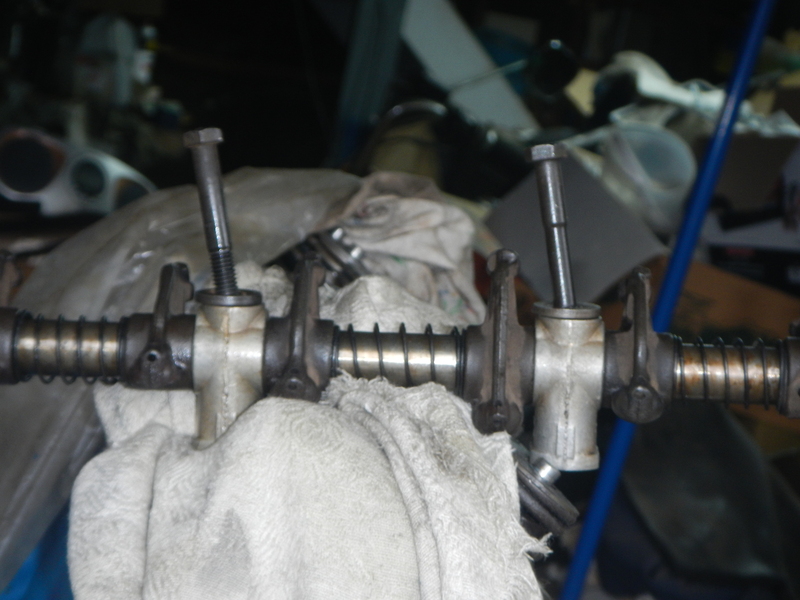 Every time a push rod relaxes, springs push the rocker arm to it's support. Slide all the rocker arms and supports off. To remove the end plug, I drilled a hole and tapped it for a #10-32 machine screw. Using a couple washers and a claw hammer, I simply pulled it straight out. To get the opposite plug out, I sent a long rod down the hole and pushed it out. Save all your parts to be reassembled later. Warning... The inside contains dinosaur muck that will get all over you. 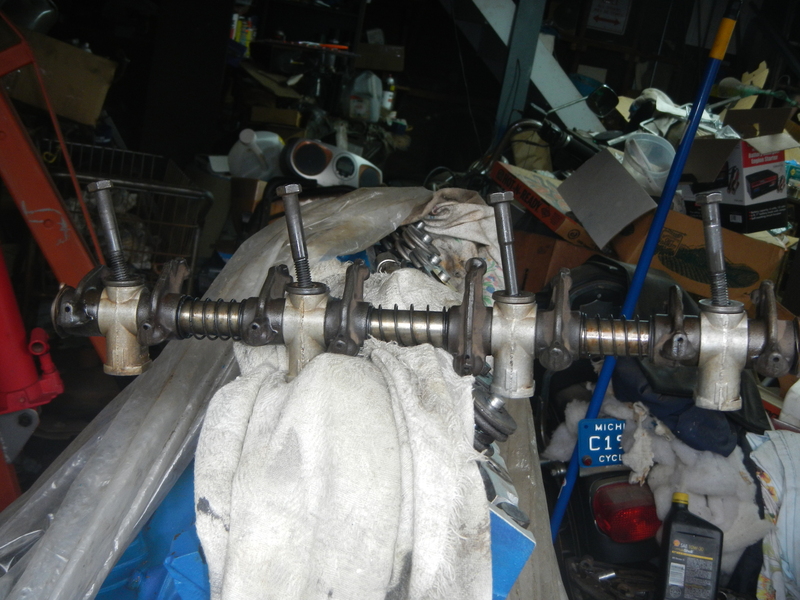 It resembles dirty but light grease that stops oil flow to all the rocker arms. Please do not use a bore brush. They always shed bristles that can quickly ruin your overhaul. Use plenty of solvent and a rag on a stick but wash it out very well. After a good cleaning, hold the shaft up to the light, and look. 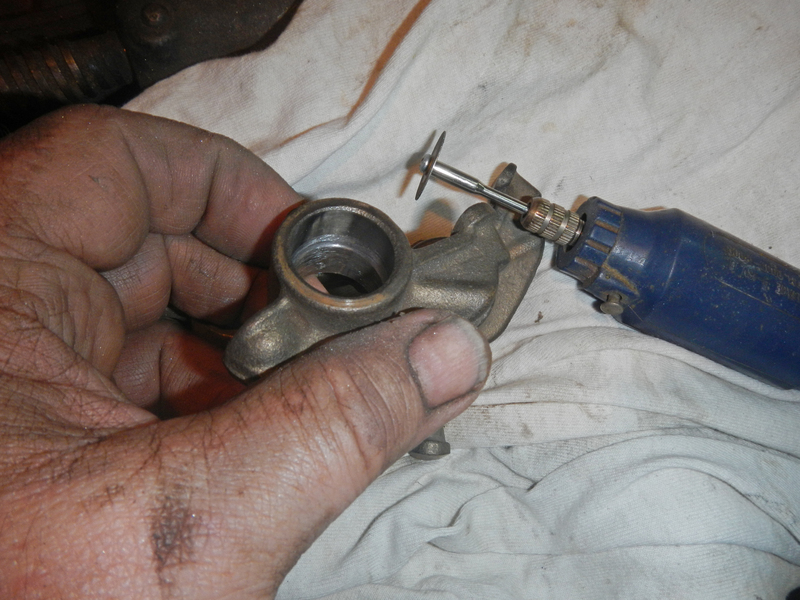 Clean the rocker arms and notice the oil groove inside. Worn rockers have these grooves 'washed out'. 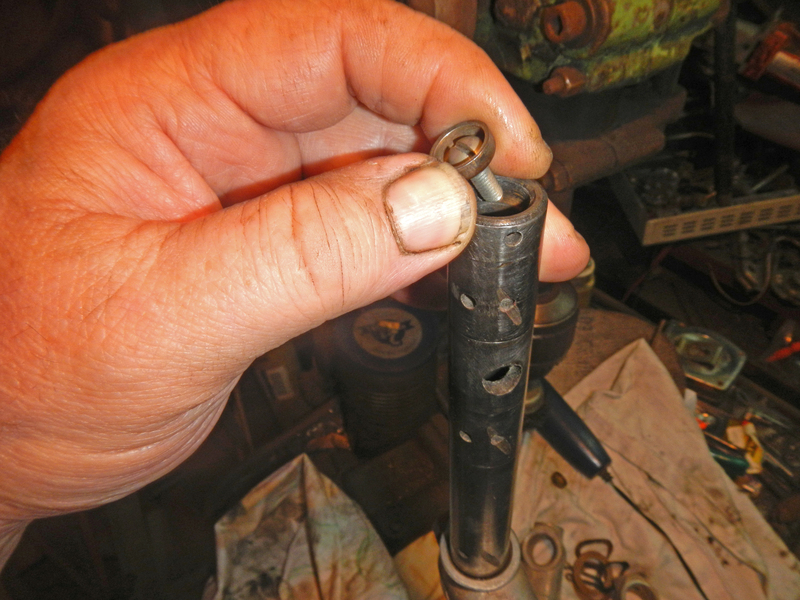 The groove directs a small flow of oil from the shaft to the pushrod and valve tip. Use a drill bit to ream the two holes, clean. 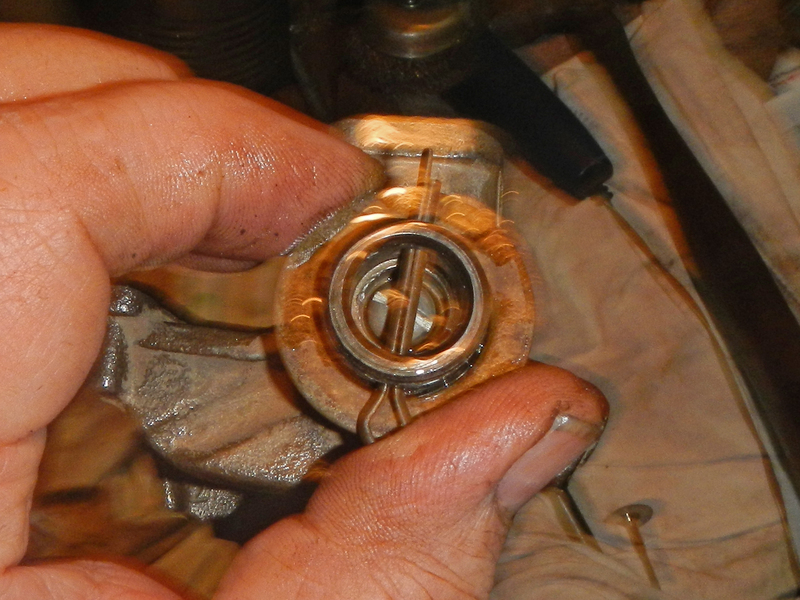 I use a Dremmel tool with a diamond saw to regroove the rocker arm oil slits. Now they're good as new. Draw your attention to these slots ground into the hardened shafts. 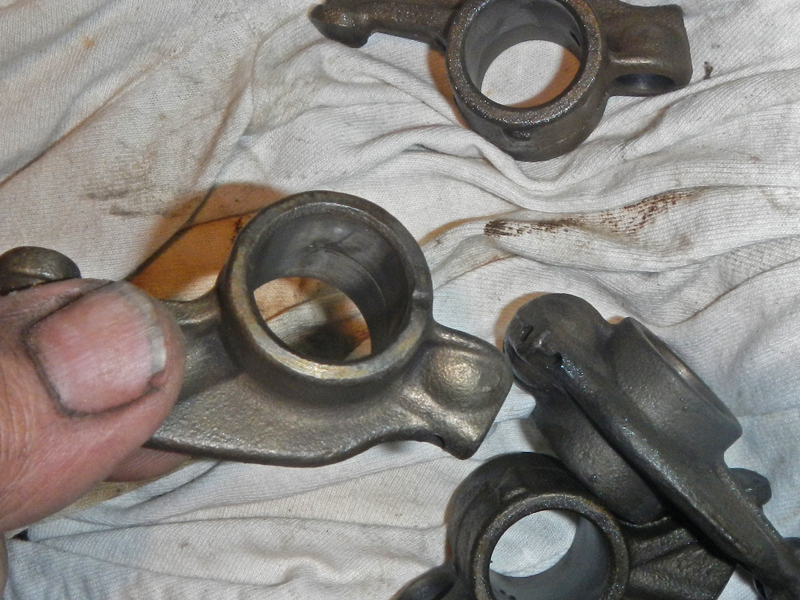 They are there because some rocker arms sit so far off they miss the oil hole on the bottom. This is the counterpart of those rocker arm grooves. 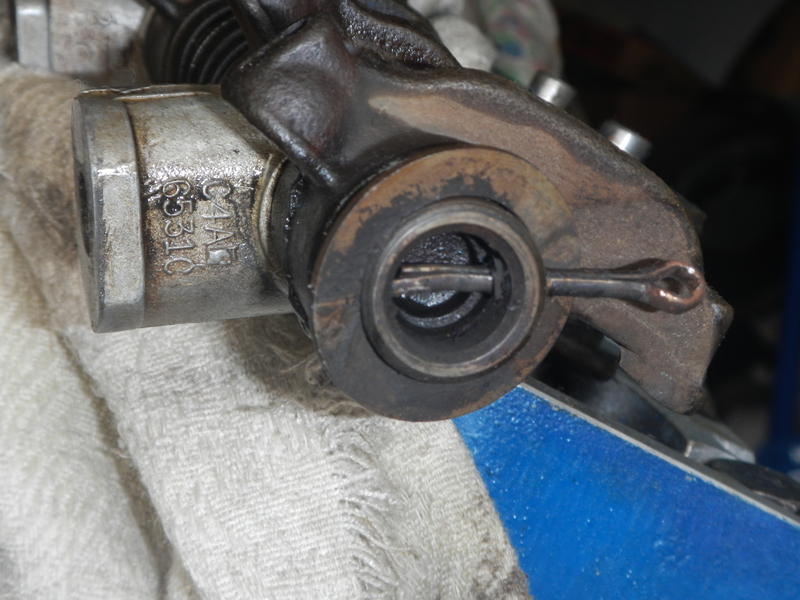 If you buy an aftermarket rocker arm shaft and these slots are missing, get a hand grinder and put them in. I plug the tapped hole by leaving the screw in. Knock the plug back in the hole until it hits the stop. The screw head neatly fits just under, but doesn't touch the cotter pin. Time to reassemble the rocker shafts. Remember, laying next to each other, both shafts and arms are identical. One is turned for the opposite bank so one notch will face the front on one shaft and the other shaft's notch will face the rear. 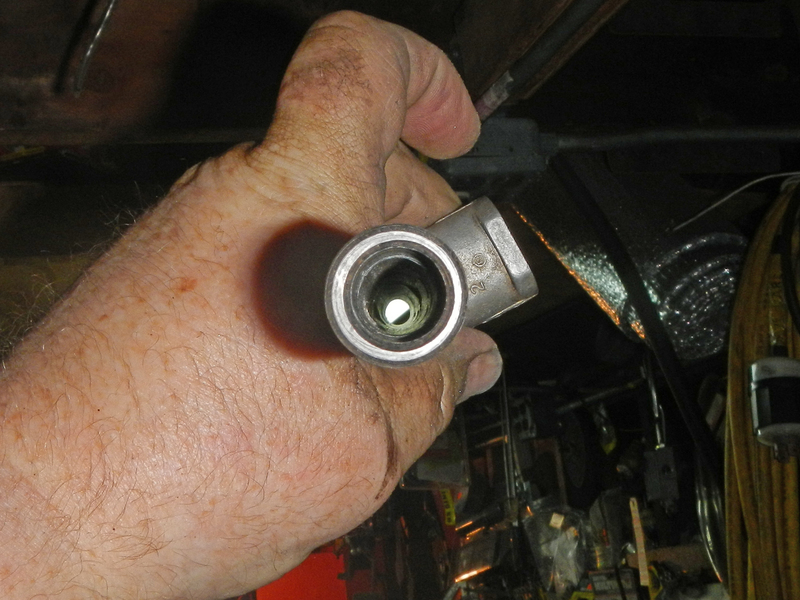 Now that the valve train is ready, BEFORE clamping the rocker shafts down, it's important to measure valve-to-piston clearance. 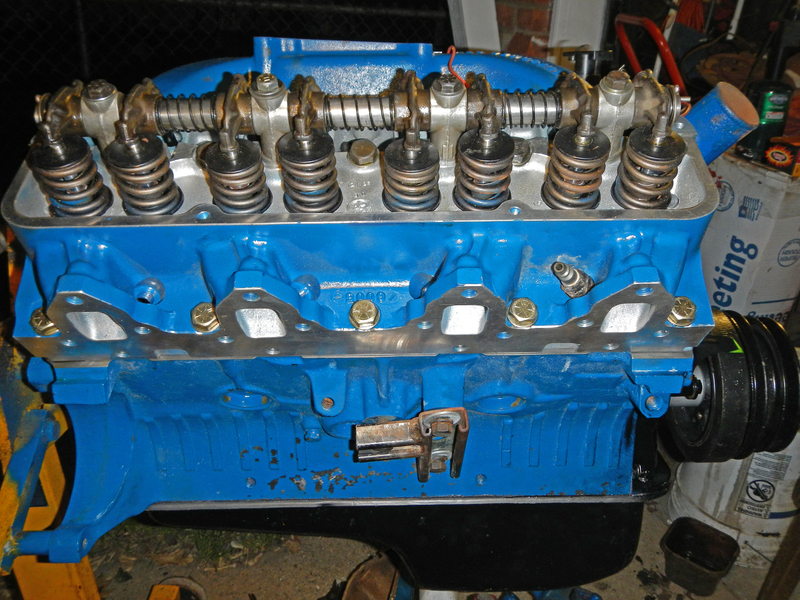 This is a new setup with different pistons, valves, lifters and pushrods. There is NO way to calculate this measurement beforehand. 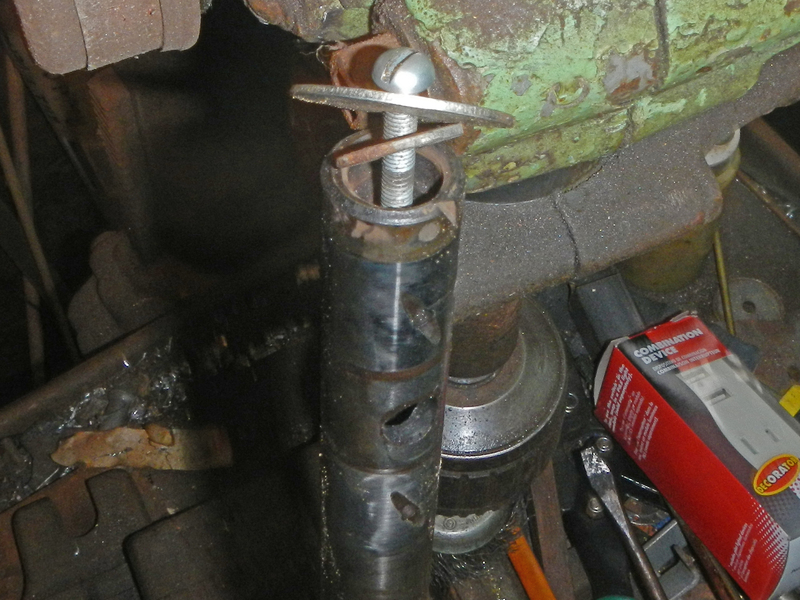 Notice the #1 spark plug has an air hose fitting screwed in. I'm about to remove the springs from #1.